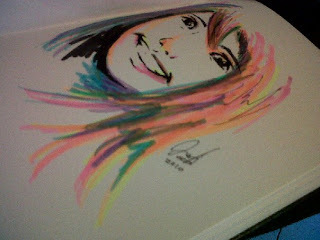 Another earlier painting using highlighter and black ballpoint pen. Sometimes, it takes a crisis for you to step out and do something you have never done before. This makes you stretch and step out in faith to do what you previously thought was "IMPOSSIBLE!" I probably wouldn't have spent time trying to paint with highlighters and using other mediums, had my workstation not crashed. Failure is never final. Cheers! Solar-Reactor - a work in progress.